Before we get going there is something that you have to understand. Red Point Fitness works with you, not for you. Make this the starting point for all of your thoughts and actions. Your willpower is the only component that can't possibly be managed by Red Point. You want this. That is why you are here. Note: Username must be between 4 and 23 characters long. Valid letters(a-z), numbers(0-9), periods(. ), and dashes(-) and underscores (_) are allowed. Choose wisely, you will not be able to change your username after this point. Note: Password Must be atleast 8 characters long and contain atleast a number and letter. 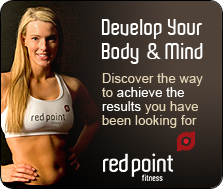 Redpoint Fitness is a subscription based service and currently costs only $17.95 per month. Monthly billing is automatic and will only end when you deactivate your account.